1. Prepare firm dough of flour and oil. Make small balls of dough and roll it like a small roti/flat bread. 2. Apply little water on edges. Place little stuffing at centre. Fold it to form a semi circle. Seal the edges by pressing the edges. Using a fork, press the edges to give a nice impression on edges of gujiya. Prepare all other gujiyas in similar manner. 3. Preheat the airfryer at 18 degrees. 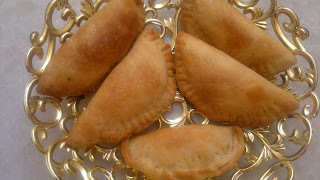 Place all gujiyas in airfryer basket and air fry it at 180 degrees for 10 min. Once brown, remove the gujiyas from airfryer. 4. Cool down gujiyas and dip it in sugar syrup for 1 min. This step is completely optional. 5. Healthy airfried gujiyas as ready to serve.